What do you know about money? 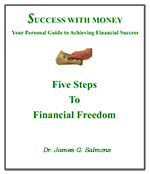 There are certain money facts and money terms, things you need to know about money so you can make the financial choices that will guide you to financial success. These articles will explain the most important for your success. The foundation for financial knowledge is spelled out in the Ten Laws of Money. This article discusses the value of consciously keeping the overall picture of the ten laws of money in mind. There are a lot of helpful things you need to know about your personal finances, but there are four essential documents you need to start your journey to success. Check them out here. Do you know about the famous financial mathematical rule, the Rule of 72? Do you know what it is and how it works? Even if you don’t understand how it works, it is a very helpful (and simple) little trick with numbers that helps you project the value of any investment. What do you know about checking accounts. They are not all created equal. Which one(s) are best for you? What is the real cost of buying a home? The answer may surprise you. It is not what most people think. You’ve heard ads about how you can get your credit report for free. But when you check it out, it is only free with an annual subscription which costs well over $100.00! Actually, the truth is you can get it for free if you know how. In this article I will tell you just how you can do it. The number of mortgages in default today is staggering. If these buyers had known more before buying they might have averted a lot of heartache. This article will point you to the information you need to get about mortgages. One of the least understood areas of personal finance is one that affects us only after we die! It is called probate. Here are the basic things you need to know to avoid or make good use of it. Starting your own business can be a terrific idea. But one of the unfortunate truths is that many of the so called opportunities offered the unsuspecting can be disastrous. Here are some guidelines to getting started in a business safely and soundly. Since 1954 one of the most popular forms of retirement investment has been the IRA or Individual Retirement Account. Everyone needs to know about this one and other offspring; here is a good place to start learning. If you only know about one kind of retirement savings/investment vehicle, this is the one you most need to know about. For good reason it has become the most preferred method for saving for your future. Paying for college has always been a challenge, but it is even more so today as costs continue to escalate. What is the best way to save for this major expense? If you fail to learn about taxes you will surely end up paying a lot more than necessary. You can not depend on others and come out on top. Here is what you need to do to learn about income taxes. There are many different kinds of savings accounts. Since we all need to make use of them at times, it is good to get acquainted with the various options available. This will get you started. One of the more important things to know about saving money is where to put it. There are times when a CD (certificate of deposit) represents the best available choice. Learn here just what a CD is and how/when to use one. With so many different kinds of bonds available for investing, and with there being so many levels of risk involved, it is important to know a little about bonds before choosing them as an investment. Here is enough information to get you started. How would you like to own Microsoft? Or General Mills? Or Walmart? Buy a few stocks and you can be part owner. But there are some things you should really know about stocks before you buy. Check this article out to get started. There is no doubt that mutual funds are one of the most important investments to know about for any serious investor (and every investor ought to be serious about where they put their money!). Here are the basics. Money Market Mutual Funds are not only investment forms that are helpful in their own right, they are also important tools for moving money from one account to others in an orderly fashion. This is one financial tool you definitely want to know about. Everyone thinks they know about wills, but here are some important facts about wills that many folks may not know. Some of them might surprise you. There are other money facts and money terms that you will want to become aware of as you work on your financial life, but these are some of the most important. If you want to know about money take the time you need to learn about them. Good decisions about money requires factual money knowledge.